At its October devices event Microsoft announced a slew of new devices like the much-lauded SurfaceBook and Surface 4 Pro. Microsoft also announced three new phones the Lumia 550, 950, and 950 XL to which the response was decidedly more tempered. While Microsoft’s new Windows Phones appear to be solid pieces of hardware it’s difficult to look at the history of Microsoft’s mobile efforts and think that these new phones are anything but more of the company’s resources being burned on the altar of ‘mobility’. What you may have missed, or more likely miss understood, was Continuum. With either of Microsoft’s new flagship phones the Lumia 950 and 950 XL you can connect to an external display via Miracast or through a USB type C connector and a branded hub. Then you can connect a mouse and keyboard either wirelessly over Bluetooth to your phone or by plugging them into the hub via USB. On your external display what you won’t see is simple screen sharing or duplicating. Instead Microsoft is leveraging its Universal Windows (App) Platform to give you access to mouse and keyboard optimized version of your favorite apps all while running off of your phone. The kicker of course is that your phone remains operable and free to do phone tasks like conference calls while you’re responding to emails, editing documents, or showing off a presentation using this external display and input setup that Microsoft calls Continuum. With Continuum your phone is now a content creation device that supports all the input and output devices of a desktop PC. It’s also still a phone and isn’t saddled with the compromises that typically come with trying to imitate bigger form-factors. Why would you buy an expensive laptop or a desktop just for work when you can connect wirelessly to a cheap Continuum hub about the size of a laptop power brick and run the desktop versions of Outlook, Word, Excel, PowerPoint, Edge, VLC, Mint, Twitter and Solitaire from your phone all while you make calls and send texts because Continuum doesn’t lock your phone up and keep it from acting like a phone. In this sense Continuum is an evolution of the thin client computing model. Continuum is Microsoft’s vision for the future of computing. As Charlie detailed in his look at the myopic plans of the PC industry’s decision maker’s: laptops and desktop are on the decline. Smart phones are now as ubiquitous as PCs used to be around the turn of the century and their popularity will only increase over the coming years. They are the most basic communications device of our current era. Phones fall into the same class of objects as money, clothes, and food that are must have items that define an individual’s ability to participate in society. The last ten years have been spent asking how do we make smart phones more useful. There have been many answers to this question: cameras, GPS, document viewing, music playback, streaming services, and web browsers. What these applications all have in common is that they address the content consumption role of the computing dichotomy and largely ignore the content creation side of coin. Even acknowledging the sheer number of pictures created on phones and the document editing apps on the market; I believe its self-evident that the phone form factor is ill-equipped to address the detail oriented process of content creation with the same level of ease and finesse as a desktop or laptop PC. But as the market and hopefully your own experience has demonstrated these answers all either compromised the functionally of the device like phones growing too large to fit in your pocket and the bendgate debacle or consumers rejected them as with Windows 8 and Ultrabooks. Given these failures we have to reconsider the question again: How do we change the form factor of phones? Continuum is Microsoft’s new answer to this question. The Ballmer era was a turbulent time at Microsoft especially in its waning days. But for all his missteps and over enthusiasm Ballmer had a clear vision for what he wanted Microsoft to be. In the end his vision was misguided and his big bets didn’t pay off. But the technical decisions that were made to support his vision like migrating all of Microsoft’s operating systems to a single kernel, making Windows ARM compatible, and developing a single application development environment to target all of Microsoft’s platforms and devices through the Windows Universal (App) Platform are the software underpinnings of Continuum. Without the ground work for a more flexible Windows platform that was laid during that period Microsoft wouldn’t be able to offer Continuum today. Stepping back over to the hardware for a minute; Continuum is a feature that is limited to Microsoft and its partners latest Windows 10 phones like the Lumia 950, 950 XL and the Jade Primo from Acer. Apparently Continuum is enabled by some hardware on the late-model Snapdragon 810 and 808 chips from Qualcomm. Older, and cheaper, Windows phones will not receive Continuum when they upgrade to Windows Phone 10. The impact of this is that Microsoft’s post-PC vision of the future is, for now, a future without Intel and is tightly coupled to Qualcomm’s roadmap. From an end-user perspective Continuum enables phones to change form factors at will. 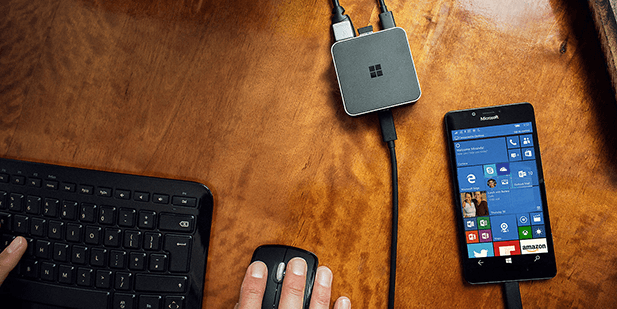 To go from content consumption and light productivity devices to full on content creation tools by plugging in a single cable or connecting wirelessly to one of Microsoft’s Continuum hubs. Microsoft’s Universal Windows (App) Platform enables the mobile apps hosted on the user’s phone to transition into their desktop versions when running through Continuum. With this model the end-user now has access to both the phone and PC models of computing while retaining the major advantage of the smart phone’s form factor which is its ubiquity and portability. The beauty of Continuum as the answer to our question is that it requires no major changes to the ~5-inch form factor that smart phones seem to have settled upon. Rather it takes your phone and enables it to replace your laptop and your desktop for the majority of use cases. The PC industry hit the good-enough-performance for anything wall in about 2010 with the launch of Intel’s Core series of processors and the advent of consumer SSDs. Now that smart phone hardware can offer performance that is in the realm of good-enough for desktop applications Microsoft is driving desktop computing, driving content creation, into the most ubiquitous form factor: the smart phone. In doing so Microsoft is demonstrating its vision for the future of computing and that vision doesn’t contain a new laptop or desktop like the PC Does Whaaat? Campaign, that the industry is pouring money into, would like you to desire. Instead Microsoft’s vision of the future is one where your Microsoft phone replaces your aging desktop and laptop for general computing tasks thanks to Continuum and when you need more performance or storage you can leverage the Azure cloud as a client. To illustrate the advantages of the Continuum model over our current PC-based computing model for Microsoft’s customers lets imagine we manage IT for a multi-story office building. Currently we have a desktop or laptop for every cubicle and they’re replaced on an as-needed or every 4-years basis. In this model IT manages these systems locally with fresh images, backups, and offers a VPN for remote access. With the Continuum model the employees would own the Microsoft phones and be responsible for them in a BYOD kind of way and all the company would need to provide is docking hubs, input devices, and a VPN to connect to and manage rather than a cadre of full-blown laptops and desktops which results in situation where we have comparatively reduced IT capital investments for employers and created more IT flexibility for employees. This illustration admittedly glosses over a number of prickly issues. But I think it effectively communicates how Microsoft’s Continuum has the potential to change the balance of power, reduce costs, and increase flexibility of computing in office environments. Who are the Hardware Players? This look at future corporate IT bring us back to considering the future of hardware. As I’m sure you’re aware, the hardware is what we really care about here at SemiAccurate. Last year at IDF Intel was showing off its solutions for wireless device charging, display, and networking. Its demos depicted a future where desktop and laptop PCs had no cables and needed no cables. As it stands now Continuum is purely a Qualcomm enabled affair, but there are credible rumors that Intel and Microsoft are working together on a phone for launch near the middle of next year. If these rumors are true then there are two chip makers in play with the potential to gain from, or at least not be crushed by, Microsoft’s Continuum.